I discovered that most of you do not see the replies I leave to all your wonderful comments. So from now on I will respond in 2 ways. I will continue to reply in the comments section because I like the idea of keeping the conversation going. If you want to see when I reply to your comment and see others' comments, you can hit the subscribe button when you submit your comment. I will also email you my responses, to make sure that you actually see what I write to you! So, if you have a Blogger account, make sure you have an email address in your profile. You can also just leave your email address in your comment! Otherwise, there is no way for me to respond. Alright, time to move on to the meat of the post. Last weekend I joined Ann Marie and Dr. Tim on a nice 7 mile run. Ann Marie let me know they had started doing "calisthenics" before their runs and asked if I wouldn't mind joining in on our way out the door. I readily agreed since I've heard that dynamic stretching is important pre-run to avoid injuries. We started down the hill with Frankenstein Walking. People were looking at us. Next, Ann Marie told me were going to look like robbers. She demonstrated the over/unders. This is when things started to fall apart. Nevertheless, I partook, even with people watching us. I think my form might have been a bit off. Once the stretching was done I decided to pull up my hood, and just before we took off running, Dr. Tim had a question. *Bonus points if you get the pun in the picture. By mile 4 it had started raining. By mile 5 it was Raining. As usual, we sprinted at the end to the very last step of our run! Dr. Tim won. I then looked down at my watch and saw we were 0.4 miles short of our full 7 miles. We couldn't leave that less-than-half-a-mile out there, so off we went around the block. Yeah, maybe a little crazy, but those who run in glass houses shouldn't throw stones, right runners? I'm linking up with Yeah Write again this week! Go read some amazing blog posts! 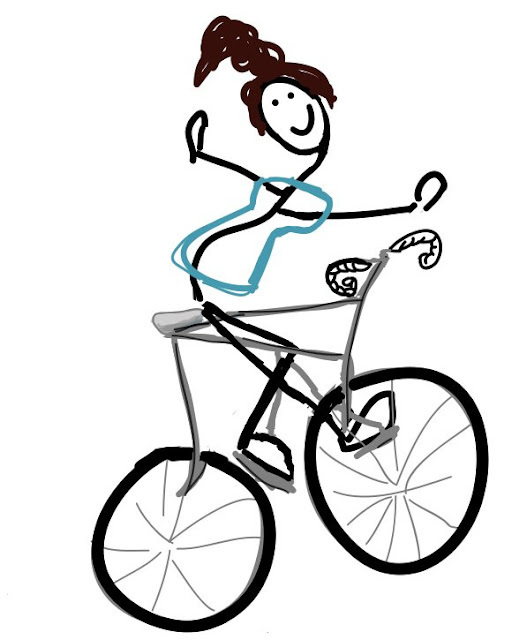 UPCOMING POSTS: BIKING, YOGA (oy), AND I WILL BE SENDING YOU OVER TO READ A COUPLE OF GUEST POSTS I HAVE BEEN INVITED TO WRITE! I once ran around a parking lot for 1/4 mile just so I saw the right number on my Garmin. A little silly, but I'm right there with you. Darn Garmin and its stats. I'm trying to figure out just how many gallons of water I should bring with me on Saturday. Do you think people would be distracted if I just pulled in a red wagon full of plastic water jugs? I'm worried I'm going to drink too much and have to pee! No Mo Commando??!! What is this pantsless world coming to? And may I claim bonus points if I think I see the pun/ drawing elevation. You may claim the bonus points after you whisper the answer to me. Or, you can send me a note in class. Okay, been there done that with the Garmin (cycling too, so it's not just runners). I don't do drills myself, but I make my cross country runners do them. Yes, it is fun to watch. Haha, I love when people let me know they're riding on the crazy train with me! Gotta be the calisthenics :) "Hurts/ridiculous", "to-may-to/to-mah-to". Wow, you are off the charts crazy! Treats can certainly be provided. If that doesn't work, we'll have to move on to blackmail. My favorite drawing is the "look like robbers." Hahaha! Hehe, that is exactly what she said, too! Too many hills and rain! Bahhh! You guys are determined. Thanks! Love the pom pom waving! It is hard to go outside when staying in is so much cozier. Some days I choose cozy. Hooray for seeing my comment!! So exciting! And, so is the gym thing. I would enjoy being cheered on at the gym, as long as you weren't being creepy about . HAHAHA "Nice". Way to be able to impart sarcasm in drawings. I can't even impart what I'm meant to be drawing in drawings. Hehe, thanks! Practice, practice, and looking at other drawings help me figure out what to draw. I love all of your drawings! Although, I appreciate and love getting responses from blogs that I read, I still know that you care. You know how? because you let your beautiful soul shine through in your posts. Thanks so much Lisa! You are so sweet :) By the way, it looks like I might be able to get a few coworkers to walk a 5k for Kyle with me! Thanks Jen! I'm glad you found me too! Now get back to "work"! Hahaha! My absolute favorite drawing was the "nice" one. Haha! I admire your running in the rain. I try not to do anything in the rain. . . let alone run. Actually, I try not to run that much at all. . .
Love the drawings! I have the same issue with people never knowing I respond to their comments. I'm sure if I investigated this a bit more I'd find a solutions. blogger? Anyone? Thanks Kim :) I'll see if more people respond now that I've alerted them. So far I haven't gotten any suggestions for auto-alerts on blogger; I guess that's a benefit of word press. I don't know, if you have to run "commando" just seems like the best way to do it. Well, there is something to that. I've been known to walk around my living room to finish my steps on my pedometer, so I totally get the Garmin thing. 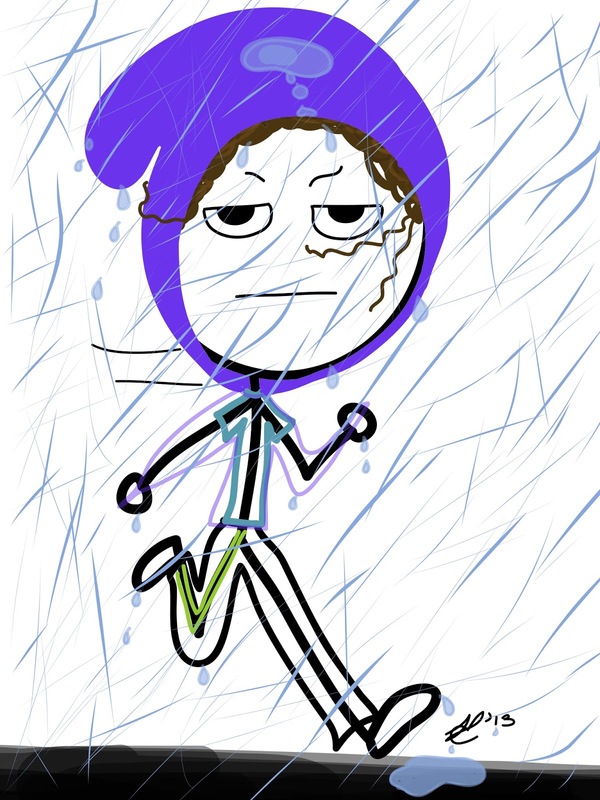 But running in the rain? Not so much! And 7 miles--yikes! Thanks to YeahWrite.Me I found your blog - this post is hilarious (can't wait to read the others!). Between the comments about going commando, dynamic stretching and realizing you were short .4 miles, not to mention the accompanying art? Comedic gold! PS: I feel your pain on the responding to comments, I do the same. I figure if they're taking the time to respond to my post, I can be courteous and give a shout out. But alas, that is when the conversation dies. I'm so glad people are here to fuel my madness, thanks! Oh, I love the air quotes and your laughing smile! And good on you for kickin' it! Running in the rain is the worst. 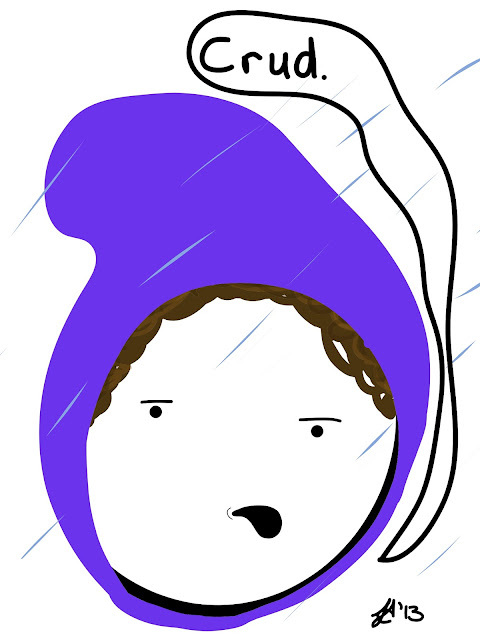 I end up like a shivering drowned rat by the time I'm at my house. I admire your dedication to the last .4 mi! Fun post, funny pictures! Yeah, but the hot shower after feels so good!! wow, way to go die hard!! that sounds like it takes some serious endurance. and without a rain jacket no less. impressive. and those warm up over/unders...looks dangerous for my old body. Thanks! Those over/unders are good if you can remember how to do them, which I can't. I didn't get the pun :-(. I feel a bit special. Way to go on the 7 miler though...and, um, the stretching! It was that the hills were "off the charts"...maybe a North American saying? Whoa! Susannah! I'm not saying your name, I'm responding to your little boy throwing upon your bed--yikes! Hope he's feeling better...and thank you for your amazing comments! I love your drawings. If the pun is sort of dirty I get it. If it isn't well I'll just apologize for my sick mind. I totally get that you had to finish that last 0.4 mile. I run with my husband a lot, and he gets so annoyed when I say we have to keep going to reach a whole mile number. I don't want to run 3.86 miles. I want to run 4 miles. Duh! Exactly! Whole miles are so much more satisfying. I'm worn out from just reading this. I think I burned liked 600 calories! Love the cartoons! Frankenstein walking...hahaha! That's some dedication right there, running in the rain. *Fist pump* Go get 'em! Thanks ModMom! Yeah the Frankenstein walking is guaranteed to get you some odd looks! I don't get the pun. That makes me sad, because I really wanted bonus points. Anyway, way to be dedicated! I don't run very often*, so you can colour me impressed. I just laughed at the elevation chart for a number of reasons....you looked like a teacher, it went off the chart....it was exaggerated.....I don't know the bonus answer!!!! 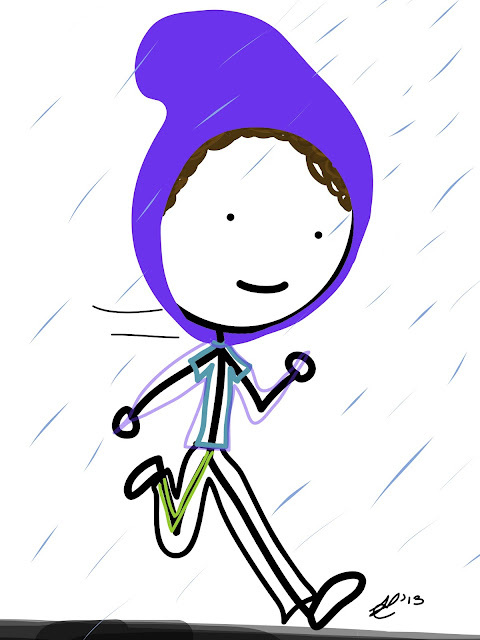 I love how all your running drawings are heel striking. I never noticed this before......I wonder if this is a sign ?? ;) gonna have to adjust your form! Those frankestiein walks would be really hard going down hill. I think I'd fall right on my face! "Off the charts" was the pun...bonus points for you! Those walks *were* hard going downhill! Oh my gosh. So, as you do, I read a lot of blogs. There aren't many that actually make me laugh out loud. I actually tried to stifle it reading this post but it wasn't to be stifled. This just made me happy. From the commando no mo, to the "people were looking at us" to the booping of the pony tail.